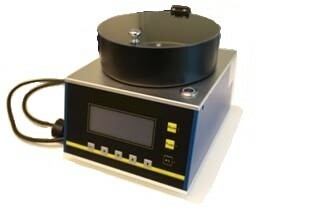 DN-HM04 is a compact, versatile, user-friendly table top spin coating equipment especially designed for laboratory solar cells. The small size makes it ideal for e.g. usage in a glovebox. The DN-HM04 has a user-friendly keyboard and a LED display for programming the key parameters, i.e. spin duration, spin speed (the speed resolution of 1 rpm) and acceleration. The substrate is held on a custom-made sample holder (up to 25x15 mm) and/or vacuum. The custom-made metal holder prevents the substrate from coming loose during rotation. In addition, we provide a universal sample holder in case of different sample sizes. The vacuum fixation allows usage of different substrate sizes from 10 to 100 mm. The oil-less pump is included in DN-HM04, i.e. it includes all you need to start using the equipment.